The campaign is in full swing. We completed our second candidates forum last night at the Shops at Hilltop. It was attended by about 50 or so people, half of them staff or devoted supporters of the various candidates. Rogers, Rivers and Bates were missing, and Pimple showed up at the end after attending the DPCCC endorsement meeting in Martinez. 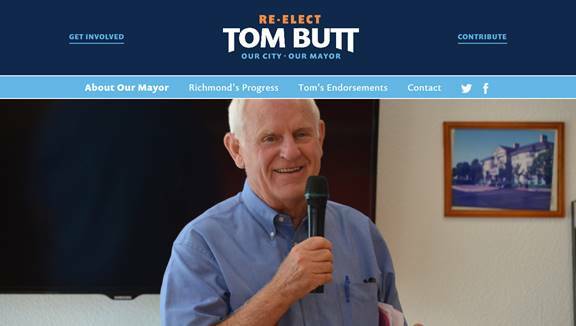 My campaign website is https://www.tombuttforrichmond.com, but E-FORUMs are still posted to www.tombutt.com. If you would like to volunteer, endorse me or order a lawn sign, go to https://www.tombuttforrichmond.com/get_involved. Although it would be nice to be running unopposed, it is still a first for me to have only one opponent. I am honored and grateful to have the most extensive group of endorsers I have ever had. I found out last night that I have been unanimously endorsed by the Democratic Party of Contra Costa County and the California Democratic Party, a recognition that has eluded me since the first time I ran for office through the six elections I won. Below is my current endorsement List. I hope you will add your name; please go to https://www.tombuttforrichmond.com/get_involved.